10 Entrepreneurs Who Failed Before They Found Success #Infographic ~ Visualistan '+g+"
For anyone who is relatively happy with their career, they will tell you that success doesn’t happen overnight. In fact, they will almost certainly have a rather large list of examples of when things didn’t quite work out for them before they finally got their first sweet taste of success. Even though it can be hard to believe, this is also the case for many of the world’s most successful businessmen and women. It is easy to think that the likes of Henry Ford, Walt Disney or Oprah Winfrey found success from day one, however, this is far from the case. 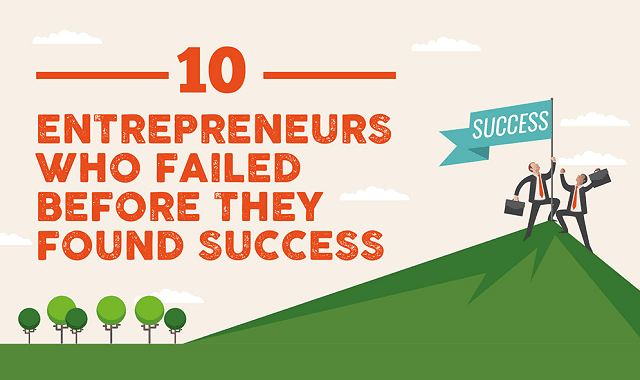 Silverdoor.co.uk has put together this great infographic titled ‘10 Entrepreneurs Who Failed Before They Found Success’. This infographic offers up lots of examples, including the names mentioned above, to show how even the brightest minds in recent history experienced plenty of failure before hitting their successful heights. Take a look below for yourself.